spuds are fitted to enable the dock to be permanently moored at its berth in Houston. The electrical system is shore power fed with a 1690 KVA ca- pacity main and 200 KVA stand- by. A 100 kw emergency gen- erator with automatic start on shore power failure is installed. The dock has its own service piping systems consisting of fire- main, air, water, oxygen and gas. These systems are all shore sup- plied. Interior communications con- sist of sound-powered phones, a separate internal phone system and a general alarm. A 25-ton-capacity crane will be installed on the offshore wingwall. An additional crane is planned for installation on the inboard wingwall at a later date. Neces- sary support facilities construc- tion is proceeding to permit start of operation of this large drydock in the port of Houston as of this month. At the delivery ceremonies Mr.
Schaefer announced that Todd is already commencing the con- struction of an additional 100- foot section for this drydock, which will increase its lifting capacity to 17,500-tons, further stating that Todd is very opti- mistic regarding the future of its ship repair, barge, and off- shore oil industry market oppor- tunities. New Orleans. The new facility is part of a multimillion-dollar cor- porated-wide plant modernization and upgrading program. From 1976 to March of this year, Todd will have invested about $165 million in facilities expansion and improvements, and an additional $52 million in work force training to improve productivity and competitive ef- ficiency in construction. Ala., was made recently during ceremonies at the builder's fa- cility to Todd president Hans K.
United States in recent years, a design reflecting the latest state- of-the-art. American Bureau of Shipping, and has an impressive lifting ca- pacity of 14,400 long tons. 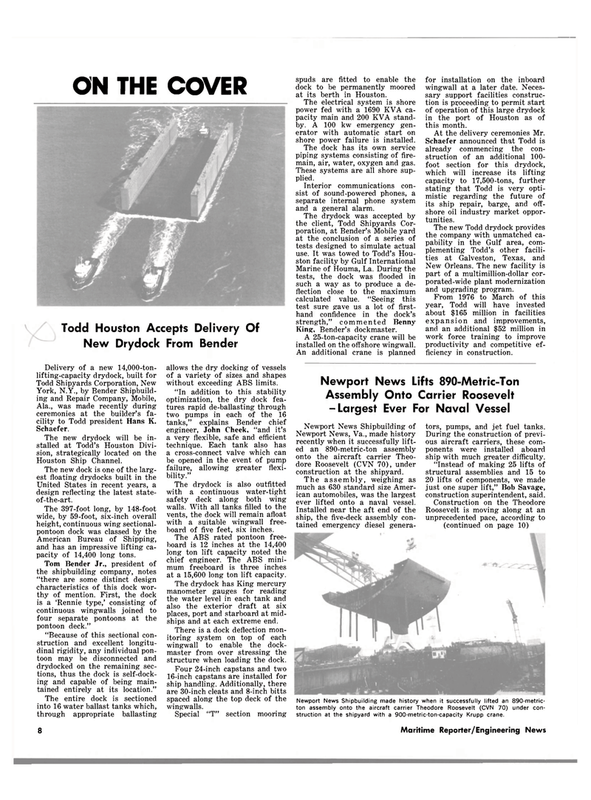 Tom Bender Jr., president of the shipbuilding company, notes "there are some distinct design characteristics of this dock wor- thy of mention. First, the dock is a 'Rennie type,' consisting of continuous wingwalls joined to four separate pontoons at the pontoon deck." "Because of this sectional con- struction and excellent longitu- dinal rigidity, any individual pon- toon may be disconnected and drydocked on the remaining sec- tions, thus the dock is self-dock- ing and capable of being main- tained entirely at its location." The entire dock is sectioned into 16 water ballast tanks which, through appropriate ballasting allows the dry docking of vessels of a variety of sizes and shapes without exceeding ABS limits. "In addition to this stability optimization, the dry dock fea- tures rapid de-ballasting through two pumps in each of the 16 tanks," explains Bender chief engineer, John Cheek, "and it's a very flexible, safe and efficient technique. Each tank also has a cross-connect valve which can be opened in the event of pump failure, allowing greater flexi- bility." The drydock is also outfitted with a continuous water-tight safety deck along both wing walls. With all tanks filled to the vents, the dock will remain afloat with a suitable wingwall free- board of five feet, six inches. The ABS rated pontoon free- board is 12 inches at the 14,400 long ton lift capacity noted the chief engineer. The ABS mini- mum freeboard is three inches at a 15,600 long ton lift capacity. The drydock has King mercury manometer gauges for reading the water level in each tank and also the exterior draft at six places, port and starboard at mid- ships and at each extreme end. There is a dock deflection mon- itoring system on top of each wingwall to enable the dock- master from over stressing the structure when loading the dock. Four 24-inch capstans and two 16-inch capstans are installed for ship handling. Additionally, there are 30-inch cleats and 8-inch bitts spaced along the top deck of the wingwalls. Newport News, Va., made history recently when it successfully lift- ed an 890-metric-ton assembly onto the aircraft carrier Theo- dore Roosevelt (CVN 70), under construction at the shipyard. The assembly, weighing as much as 630 standard size Amer- ican automobiles, was the largest ever lifted onto a naval vessel. Installed near the aft end of the ship, the five-deck assembly con- tained emergency diesel genera- tors, pumps, and jet fuel tanks. During the construction of previ- ous aircraft carriers, these com- ponents were installed aboard ship with much greater difficulty. "Instead of making 25 lifts of structural assemblies and 15 to 20 lifts of components, we made just one super lift," Bob Savage, construction superintendent, said.